Matomo (Piwik) offers real time web analytics reports. When you request data for “today”, or “current month” or any date range including today, the reports will include the most recent visits, ensuring you always access up-to-date analytics data. By default, reports are processed every 10 seconds but you can customize this delay in the administration “General Settings” page (more information in the documentation). The Visits in Real-time report is available under Visitors > Real-time, and also available to be added as a widget in your custom Dashboards (Dashboard > Add a widget > Visitors > Visits in Real-time). 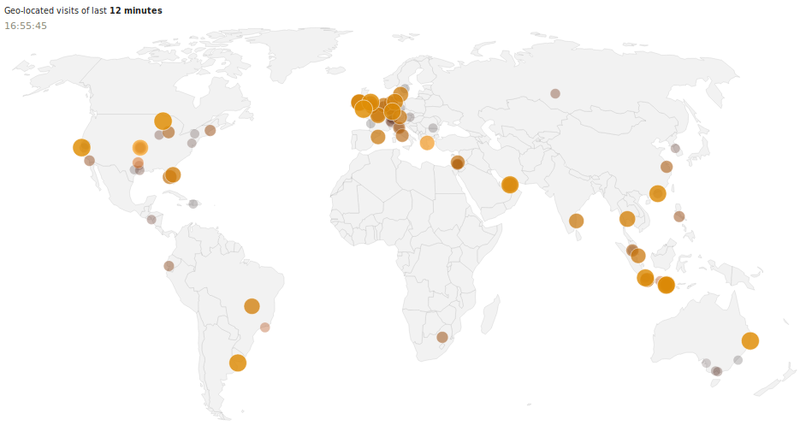 This report shows the real time flow of visits to your website. 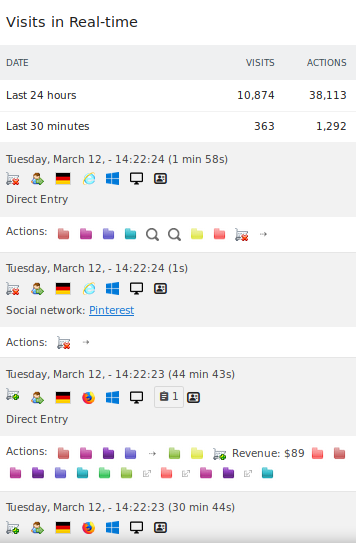 It also displays a real time counter of your visits and page views in the last 24 hours and the last 30 minutes. If you hover over these icons, you can also see the resolution and the list of enabled browser plugins. 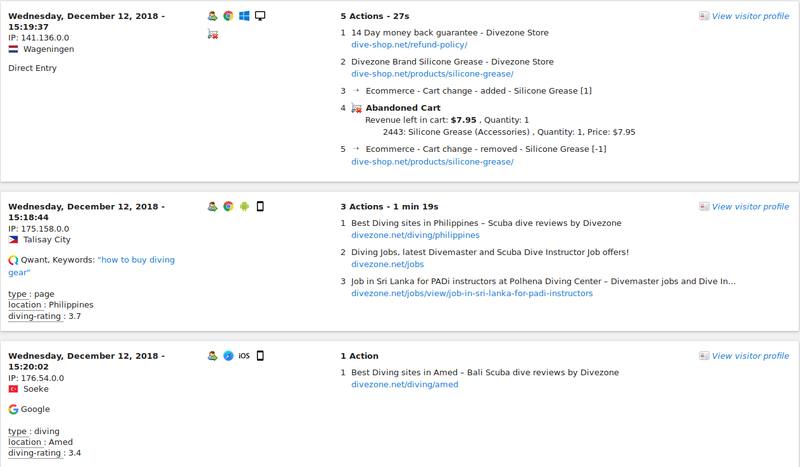 The Visits in Real-time report also shows the list of page views and actions the visitor performed on your site. Hovering over the icon will show the page name and the time that the page was accessed. Clicking on the icon will open the actual page on your site. You can see the Visits in Real-time report on the official Matomo (Piwik) Demo. To open the Visits Log click on the main menu Visitor > Visits Log. The Visits Log is a tool that allows you to see all the visits on your site, and browse through these visits to check on individual user sessions. You can click Next at the bottom of the page to access previous visits, or change the date in the calendar to access visits from different days. The Visits Log shows the same data as the Live! widget as well as any Custom Variables you may have set on your visits. It doesn’t refresh automatically but of course you can reload the page to see your latest visits. It is useful to browse individual user sessions on your site and understand what your visitors were looking for, whether they found an answer, or to see which pages they looked at before converting your Goals. You can see the Visits Log on the official Matomo (Piwik) Demo. Note about Embedding Visits Log: If you are building a web application or provide Matomo (Piwik) as a service for your customers, you may want to allow access to the Visits Log in your existing design. You can easily embed the Visits Log for a specific idSite/date, see the result here. Click on Administration > Platform > Widgets for more information. The Visitor Profile shows in one report a summary of information about a particular visitor to your website, or user of your app. 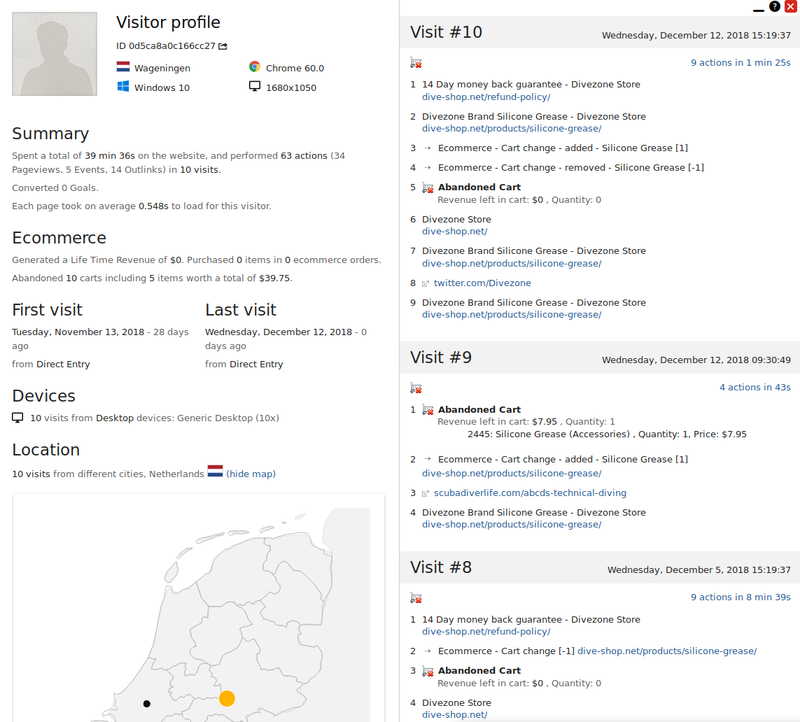 The Visitor profile lists all previous visits from this visitor, and information about the first and last visit, as well as showing the map with visitor location(s). This report is available in real time for any visitor currently on the website, but you can also see the report for any visitor in the past by browsing the Visits Log or selecting another date in the calendar. Learn more about the User Profile. With the Real-time map, you can literally view your website traffic in real-time! The map is available in the Visitors > Real-time Map. Learn more in the Real Time Visitor World Map user guide. The Matomo (Piwik) Live! API gives you easy access to all visits and actions on your websites. The Live! API can be used to query individual visitor records or fetch all of the visits in a given day or date range. You can, for example, use it to integrate with other user databases to get a global view of the path and history of your visitors from the moment they found your website, to conversion, and later to their retention and experience of your site or application. Try integrating Matomo (Piwik) with a CRM, Customer databases, ECommerce databases, or existing data warehouse. Analytics API documentation). These are based on the Matomo (Piwik) Forums analytics data. Read more about general information about the Live! Matomo Analytics (formerly Piwik Analytics) API in the Analytics API Reference page. The Visitor IP (visitIp field) and the Unique Visitor ID (visitorId field) will be displayed in the user interface and returned in the API output only if you are logged in Matomo (Piwik). For privacy reasons, we do not display the IP or Visitor ID to anonymous users.